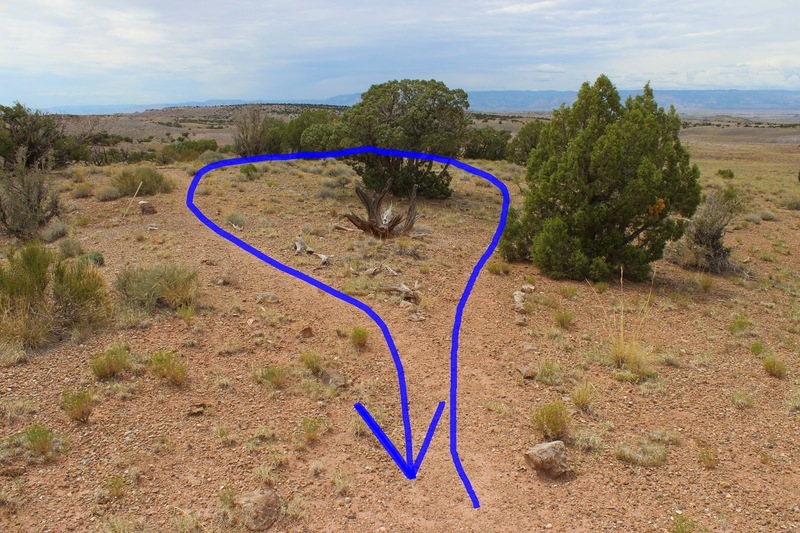 The Raptor Point and Rim Walk trails are located at the Cleveland-Lloyd Dinosaur Quarry about 30 miles south of Price, Utah. Both trails can be hiked together or the Raptor Point trail, which is the shorter of the 2, can be hiked by itself. The Raptor Point trail leads to a spot overlooking the quarry and Visitor Center while the Rim Walk trail continues along the edge of the mesa overlooking the entrance road. Both trails help to acquaint hikers with the geology of the area where dinosaur bones are found. For directions and a map to the Cleveland-Lloyd Dinosaur Quarry see our post for the Rock Walk trail or visit the BLM's website for the quarry. Since the site is open only seasonally from late March to the end of October you may want to contact them to be sure they are open and to check the current road conditions. The Raptor Point and Rim Walk trails begin at the end of the paved wheelchair accessible trail just past the quarry buildings. The trail begins by climbing the hillside where it gains about 180 feet of elevation. A few spots might require careful footing but the climb is short. The trail forks as the climbing levels out. Raptor Point is a little higher along the left branch of the trail. From Raptor Point there is a birdseye view of the compound below. Off in the distance the Cedar Mesa area can be glimpsed. From Raptor Point the Rim Walk trail is now an easy stroll as it continues west across the edge of the mesa. From the rim there are views of the colorful geology which unfortunately our camera doesn't do justice to because of the overcast skies. The overcast skies might be bad for pictures but they knock 15 - 20 degrees off the summertime temperatures. The Jurassic Morrison formation is where the dinosaur hunters of today ply their trade. Colorful bands of purple can be seen in this picture where volcanic ash was deposited in an ancient lake. It is not uncommon to see fragments of fossilized dinosaur bones and bone casts when hiking in the Morrison formation. The Rim Walk ends with a small loop before heading back to the Visitor Center following the same route along the mesa. The dinosaur quarries are inside of the metal buildings so be sure to go inside before you leave. We are making them part of a separate post since they are wheelchair accessible. It took took us about 3.5 hours, not including the drive, to see everything and hike all the trails since we combined the Visitor Center with the Rock Walk and the quarry with Raptor Point and the Rim Walk hikes. After coming all this way you may as well try to cram in all that you can. If you would like to see it for yourself then all you have to do is 'Take a hike'.